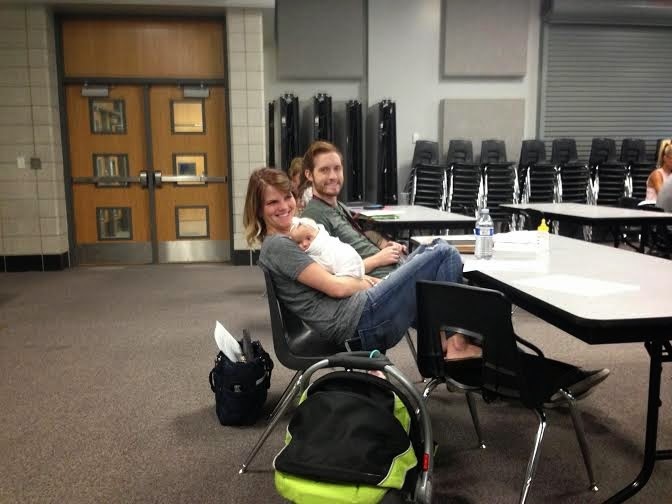 School wide training or hanging with my family? Why, it's both! A couple of people have asked me on various social media outlets what it's like working at the same school as my husband. The short answer: it's awesome! At first I was a bit nervous when Greg took the job at my school. I have always felt that it is really good for both partners in a relationship to have their own interests/ identities/ jobs/ friends. Greg did was enjoying helping those with special needs and doing shows at night. I did my thing at the high school. We had our own circles and friends, and when the offer came to work at the exact same school, I was undoubtedly nervous that we couldn't handle working that closely together. Space is good for relationships, you know? Would merging our lives together so extensively take a toll on both of us? I have heard horror stories about couples that work together- after all Lucille Ball and Desi Arnaz divorced after creating one of the most successful tv shows ever, I Love Lucy. Turns out all of those fears were for naught. To start with, even though we work at the same school, we are still very involved in our separate programs. We also are not very physically close within the school- Greg is downstairs on one side of the building, I'm upstairs on the other. As far as "work" goes, we hardly "work" together. He is busy teaching kids how to do monologues and directing a musical while I am teaching research skills and grading essays upon essays across the building. It is during the "nonwork" time- lunch, after school, etc, that working at the same school really has its perks. We get up at the same time in the mornings and are out the door by 6:45. (Disgusting, I know.) Most of the time we take separate cars because Greg has to stay for Les Mis rehearsal (the musical he's directing) and there ain't no way I'm staying at the school until 5:00 or later every night. I take June with me in the mornings, mostly because her car seat is in my car. I drop June off at the daycare downstairs in between 7:00 and 7:10 and then I'm off to do last minute preparations before first period starts at 7:50. Greg's prep is second period and we both have lunch immediately following. During his prep he always goes and visits June. (Most of the time she's passed out cold, though. Not interested in her daddy's visit.) The last five minutes of second period Greg pops in my room and sits at my computer while I finish up the lesson, and then we walk down to the faculty room together to eat lunch. Most of the time we sit by each other, but sometimes I want to catch up with some of my other teacher friends who I don't get to see that often, so I sit by them instead. It's really important to me that I still maintain relationships with my work friends even though it would be easy to just bag it and rely on Greg for my social interaction. But I totally believe that while your spouse is your most important relationship, it is certainly not the only important relationship. I am so grateful for my friends at school, (a group of intelligent, opinionated, and hardworking people) and so I am trying hard to still cultivate those relationships. Greg and the other male teacher in our group usually just sit there and listens to all the ladies talk a million miles an hour. And trust me, it is a million miles an hour. You gotta fight to get your words in sometimes! I don't know how long this gig will last for us, but for right now I absolutely love it. Greg's long hours at the high school would be much harder on both of us if we didn't get to see each other here and there throughout the day. It also makes it so nice that we can see June often and be close to her in case there is any kind of emergency. My principal asked me the other day how it was working out for the Larsen clan all being at the same school together, and I practically gushed all over him, "Oh my gosh, we love it! We feel so grateful! Thanks so much! It's such a perfect set up I'm afraid to even breathe!" He chuckled and replied, "Well, I guess I'll start holding my breath around you then!" So awesome! I know it's not the same thing but in college I got my best friend working a job at the same place as me and everyone was like - well you live together and now you're gonna work together, won't that be too much? But it wasn't! It was the best. Then when I was teaching I became best friends with another teacher and when my lease was up I moved in with her and again everyone was very concerned that it would be "too much" togetherness but sometimes you just have relationships where it works! So lucky and happy for you that everything is working out! Especially because I feel like theater/ drama teaching jobs are SO HARD to find (at least in NY they were) so how amazing is it that everything fell into place?! Aww, I am so glad it is going so well and that June bug is close by! That's great! It is so amazing that the school has a daycare for june!!! I wish my job did! How wonderful! Glad you and Greg are both enjoying it! Sounds wonderful that you get to spend time with your family in the day, family really is important. This kind of reminds me of when my band director and his wife (they both also directed the plays and musicals and she ran the color guard squad) had babies and we would all want to babysit them. Also, I'm totally jealous that Greg gets to direct Les Miserables and those high schoolers get to be in it. Although a group in my area might be doing it this summer so you know I'll be auditioning. That is awesome, glad it's working out so well for you! hello this sounds great and also a bit like Tammy and Coach Taylor on Friday Night Lights, who are the best. Yes, the high school students are SO excited to be in Les Mis. It is insane. And that is adorable about the band director and his wife. All the kids at Greg's rehearsals are always trying to hold June, so maybe that will be us too! Thank you so much Julia! I appreciate it. I haven't seen it, but I will definitely have to! I have heard a lot of good things about it! My name is Wendy Streeter,and i live in New York. My Ex-Husband dumped me two weeks ago after I accused him of seeing someone else and insulting him. I want him back in my life but he refuse to have any contact with me. I was so confuse and don't know what to do, so I reach to the internet for help and I saw a testimony of how a spell caster help people to get their ex back so I contact the spell caster and explain my problem to him and he cast a spell for me and assure me of 48hours that my ex will return to me and to my greatest surprise the third day my ex came knocking on my door and beg for forgiveness. I am so happy that my love is back again and not only that, we are about to get married. Once again thank you Dr Brave, You are truly talented and gifted. Email: bravespellcaster@gmail.com is the only answer. He can be of great help and I will not stop publishing him because he is a wonderful man.Email:bravespellcaster@gmail.com,or kindly visit he website http://bravespellcaster.yolasite.com .He is the best spell caster.